A birthday party means balloons, friends, cakes, lots of fun and masti. If you are looking for a cost-effective yet glamorous birthday party, then we are here with 6 super easy balloon decoration ideas for birthday parties that would help you to throw a grand birthday party without disturbing your monthly budget as well. A garland of colorful balloons can be organized at any place or corner of your party hall. It is one of the super easy ways of decorating your event and making it one of the best birthday parties of your life. All you need to do create a colorful garland of the balloon is colorful balloons, strong thread to hold the balloons and tie the garland at a specific place. Balloon Arch can be used to decorate the entrance area of your birthday party event. You can easily create a balloon arc in the same way you created the garland of the balloon. The only thing that you can do is to take a flexible thread to add the shape of an arch to it. This balloon arc can be used at the entrance, at the center stage, and at so many other places to give your party hall, an entirely new look. Most of the kids are fond of eating sweets and candies. If you are throwing a party for the birthday of your little one then does not forget to fill the balloon with sweets and candies. Then allow the birthday boy or girl to take one colorful candle and place it near the inflated balloon (filled with sweets and candies). Let the balloon burst and the sweets and candies to drop on the floor. Allow kids to grab as many candies and sweets as they can. One of the unique party decoration ideas includes creating a balloon wall that can give a beautiful backdrop to the guests to capture their photos and make the event memorable. Take colorful balloons and stick them to the wall of the area where you will cut the cake. This is quite a common idea that most of the people use to add some colorful factor to the return gift. Kids love to accept return gifts when the party is over. Inflate colorful balloons and tie them to the return gifts. This idea holds well when the birthday party is organized at night. Place some glowing sticks inside the balloon and inflate. Now use these balloons and decorate the party area. These glowing balloons look best when the party is outside. Try this trick to make your birthday party one of the best parties. 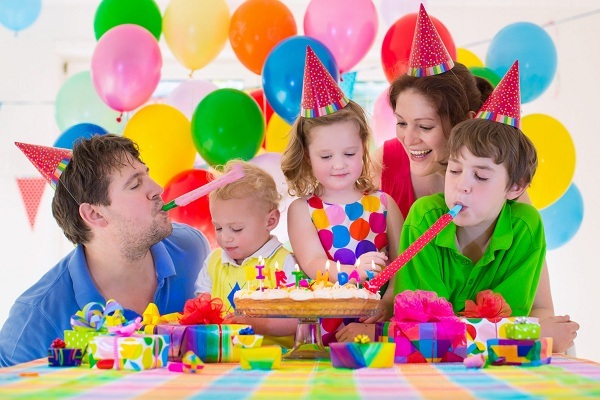 Above are 6 super easy ways of decorating a birthday party using colorful balloons? Hopefully, you liked the idea and consider these tricks on priority to surprise your loved ones in a cost-effective way.